Owning a wood splitter is a good idea if you’re someone who’s been splitting firewood with an axe. Some people hesitate to spend money on tools because they don’t realize how much time they will save but sometimes I find it hard to understand because people spend lots of money on cars, blenders, lawn mowers, etc. Splitting firewood is a tedious task that takes its toll on your body. Woods splitters were designed to make your life easier by allowing you to conveniently to split logs whenever you need to. We begin this article by explaining the basics about firewood and then we discuss log splitters in detail. We cover a wide range of wood splitters to give you some options to consider, including: manual, electric and gas models. We strive to inform our readers about the products they are interested in buying. We believe that knowledge is power and ultimately you have to decide what wood splitter is right for you, taking into account all factors, including what you can actually afford. We hope you find this guide beneficial. Fire isn’t something that humans developed. It existed way past the era in which human beings walked the Earth. In fact, in the pre-human era, fire was linked to more than just heat. It was tied to the existence of plants. For fire to come into being, it needs three components to exist together. These components are none other than heat, fuel and oxygen. Plants help ensure that the last two components are available for they provide us with fuel (wood) and oxygen (which is the byproduct of photosynthesis). The question then arises as to how heat entered the equation. It has been postulated that the heat was provided by lightning, volcanoes and falling meteorites. It has also been postulated that since oxygen was not available in its free form before plants existed, fire too did not exist. That however was billions of years ago. Scientists believe that the man’s need for fire began to develop around the same time he realized the benefits of cooking. Some even believe that it was this invention of fire and its use in cooking that split us from apes and gorillas on the evolutionary curve. While we may never know the real truth, one thing is certain… The use of fire became a crucial part of man’s life over 800,000 years ago. Primitive tools our ancestors used before modern tools were invented. While the world may have advanced at a rapid pace, human beings are still highly dependent on fire. That by default means that man is dependent on fuel. While fossil fuel and coal help provide for over 80 percent of the world’s power needs, the use of firewood is still rampant. Firewood is used for the same basic reasons that were used by our ancestors. It all boils down to food and warmth. ✓Learn more about fire on Wikipedia. Unfortunately for us, all wood isn’t the same. When it comes to firewood you need to differentiate between the good firewood and the bad firewood. The so-called bad firewood, is wood which has high levels of moisture in it. Good firewood is wood which has been through a drying process called seasoning. The difference between these two can be clearly noted when the wood is burned. Bad firewood will pop and hiss but seasoned wood will not. These popping and hissing sounds are signals that the moisture from the firewood is trying to escape. Unseasoned wood produces less heat when compared to seasoned wood. This makes it less desirable. ✓Learn more: A burning story: The role of fire in the history of life. As we have mentioned before, the process of drying the firewood is called seasoning. Wood which has been freshly cut contains a lot of moisture. In some cases, these moisture levels can be as high 70 percent. High levels of water do not help the burning process in any way as they hinder the process of oxidation. Ideal firewood contains less than 25 percent of moisture and burns quickly while producing large amounts of heat. This is why it is more coveted than unseasoned wood. The process of seasoning can take as long as 9 months. It involves cutting and stacking the freshly cut wood in such a way that it can be dried by both the sun and the wind. Moisture of the wood generally does not leave the wood from the bark. That is why the wood needs to be split. Once the wood is split, the newly exposed surfaces help the moisture escape. Dr.Meter MD-812 and General Tools & Instruments MMD7NP. Determining the amount of moisture in the wood will help you in the process of buying and drying your firewood. Determining the amount of moisture however is easier said than done. A wood moisture meter may just be able to solve your problem. A wood moisture meter is a device which has been developed specifically for the purpose of determining the amount of water that a piece of wood contains. It is important to note that these devices give an approximate value of the moisture content in the wood and not the absolute value. A fully featured moisture meter. Easy to use. Pinless model. The wood moisture meter can function on one of the following two principles. Both these principles are rooted in the fact that water conducts electricity and dry wood does not. This means that the higher the percentage of moisture in the wood the more easily the electricity will pass through it. To frame that a little differently, one would say that the high moisture content provides less resistance to electricity. The more the resistance that is found signifies that the wood has lower water contents. People very often refer to firewood in ‘cords’. The term ’cord’ came into being as early as the 17th century. In fact, the earliest use of this term can be traced back to the year 1610. In that era, people bought firewood in bundles. Can you guess what these bundles were tied by? Yes! That’s right! It was a cord. That is how the measurement of firewood came into being. It is almost impossible to find a piece of wood that large and it is even more impossible to carry it home. That is why the actual cord of wood consists of smaller pieces of wood which are stacked together. While the length of the whole cord is 8 feet, the length of individual pieces of firewood is usually standardized at 16 inches. This is because this is one third the length of the entire cord. It makes it easier to cut and it is also easier to handle and stack. This knowledge is important when it comes to buying firewood. Since a full cord maybe too much for a single house to consume in a winter, sellers now sell portions (or parts) of the cord. Each type of portion has been given a different name. Let’s take a look at how you can calculate the cost of the full cord based on the price of each portion. The conversion is simple. All that you need to do is convert the price of each of the cords to a full cord. Then you can compare the rates of different sellers easily. The conversion formulae are listed below. Once you do the conversions then you can compare the cost easily. Sometimes, the wood may appear more expensive after all your calculations. Don’t judge the wood just yet for it may still be a good buy. It may sound counter-intuitive but you need to consider a few more factors that can also influence the price of the wood. Splits firewood with less force than a standard axe. Designed for safety. What is the length of the firewood? Take a look at the firewood. Is all the wood of almost equal length? If so, then you have just realized why the cost of the wood is a little more expensive than you thought it would be. Equal sized pieces of wood are easier to handle and store. It also means that the supplier has paid a lot of attention to detail. This kind of wood is valued and hence is expensive. Has the wood been split down to a small size? Another important factor that can influence the price of the wood is how the wood has been cut. Smaller pieces of wood are more expensive because it requires a lot more labor to get the pieces down to a smaller size. It is also important to note that smaller pieces of wood are usually well seasoned and hence the quality of the wood is infinitely better. On the same note, it important to understand that dried wood is also much more expensive than fresh wood. This is because the wood has a low level of moisture in it. The process of drying the wood is long and arduous. That’s why it is justified that this wood is more costly. Splitting the firewood is a big job. It is however a job that needs to be done. Wet wood (or wood which has high moisture content) does not burn well. It produces less heat, is noisy and has a large amount of emissions when compared to dry (seasoned) wood. Wood which has been split dries faster as there is a larger surface area which is exposed to the elements. In addition to this, there is another reason why splitting wood is important. Smaller pieces of wood are easier to burn. It has been proven that the largest cross section of the most efficient firewood is always not more than 6 inches. The usual cross sectional range of firewood that is used in stoves and fireplaces ranges anywhere between 3 to 6 inches. Compact electric splitter can be used anywhere. Easy to transport. Wood splitters are very often called log splitters. So don’t get confused if someone uses the names interchangeably. In fact, you will even find both these terms used in this article. A Wood Splitter is a device (or a piece of machinery) that helps us split firewood. It used after the wood has been cut into round sections. This piece of machinery can be used on both softwood and hardwood. The Wood Splitter is compromised of either a hydraulic (or an electric) rod and piston. This assembly helps the device produce tons of force. Wood Splitters can be differentiated based on the amount of force the produce. They are also differentiated on the basis of whether they use electricity or fuel. Residential Wood Splitters do not require as much power as commercial wood splitters do. These Wood Splitters have a rating of around 10 tons. Commercial Wood Splitters on the other hand can have a rating of up to 25 tons. Some commercial Wood Splitters can be even more powerful. Every device needs some form of power. If there is no obvious fuel or power source, then it is safe to say that you are powering it with your own energy. The simplest of all wood splitters are manual splitters. There are those that use electric sources and then there are others that use either diesel or gasoline. These wood splitters can function with and without a tractor but it is best to check the manual and see what your wood splitter needs. The problem with electric wood splitters is that you need a power source. Since the power source needs to be at hand, using these devices becomes difficult because of its portability. The non electric wood splitters however are much more portable. Wood splitters have got popular because of their obvious advantages. The drawback that people face with this kind of machinery is safety. When you are dealing with a device that can produce anything between 10 to 25 tons of power, you have to be careful. Unfortunately, while most manufacturers try their best to make these products safer, they can never be completely safe. That is why almost all products come with a warning. A wood splitter is said to be in the safest when it is in the hands of a cautious trained adult. How are Wood Splitters being made safe? Due to the large safety risks, manufacturers have now started using the two hand operation method. This means that the person handling the device needs two hands to keep the device fully functional. Without that the device will not work. How is the two hand technique effective? When a person needs only one hand to operate the device, it is but obvious that the other hand remains free. This increases the chances of the free hand coming under the razor sharp blade which is crushing wood at tons of force. The two hand operation technique ensures that the machine won’t operate unless both hands are out of harm’s way! What are the additional safeguards that can be used? An addition safeguard is the use of a safety zone. The safety zone should exist because the behavior of the spilt wood is erratic and cannot be predicted. This means that the wood can fly in any direction. If you take the amount of pressure and force that is used to split the wood into consideration, you will understand that the pieces of wood can hit you with a good deal of force. That is what makes a safety zone important. Like we said before, wood splitters can be manual or mechanical. To truly understand the difference between both, we need to take a peek at the different kinds of wood splitters that are available in the market. Ram return spring for quick reset. For logs up to 18″ long x 8″ in diameter. Powerful hydraulic ram builds up to 10 tons of driving force. Log cradle prevents split wood from falling. Ram return spring enables a quick reset. Easy to use – no gas, oil or cords. Wheels make it easy to move around. ✓View or download the MANUAL. Another good manual wood splitter is the Sun Joe LJ10M Logger Joe. Let’s take a look and see what this piece of machinery has to offer. The Sun Joe LJ10M is a little more complicated than the Anaconda 878 Slide Hammer. The machine is made up of steel which makes it extremely durable. The Sun Joe LJ10M can produce a force of up to 10 ton. This is particularly useful in splitting logs with knots. It is important to note that this machine can handle logs that are 18 inches in length and 8 inches in diameter. Ensure that the log ends are square cut. This means that the cut should be made at a 90 degree angle to the length of the wood. It helps ensure that the wood does not slip. How does the Sun Joe LJ10M Logger Joe work? Like the previous device, the Sun Joe LJ10M Logger Joe uses no electricity or fuel. It requires manual energy to set it into motion. The phrase ‘Log on, Log off’ is often used in connection with this device. This is because of the way the device functions. With a wedge fitted firmly at one end, the log is fitted between the wedge and a movable piston. The use of two movable handles helps you move the log closer and closer to the wedge. With the amount of pressure building (almost 10 tons of it) the log eventually splits. It is now time for the log off phase of the device. The two hand technique has been incorporated in this model and helps keep both your hands are out of harm’s way. That’s point one! The second safety feature that has been incorporated is the use of log racks. These racks catch the wood as it falls. This means that the pieces of wood won’t fly straight at you. The manual gives you a great deal of information about what you should and shouldn’t do. In my opinion, the Sun Joe LJ10M is safe as long as you follow their instructions. The Ram return spring: This helps the device to reset automatically and resume its original position. It helps save both time and energy. Wheels: Unlike the previous model, the Sun Joe LJ10M is not light. It however comes equipped with a pair of wheels that helps increase its portability. Assembly: The Sun Joe LJ10M is easy to assemble. The manual shows a step by step procedure and safety instructions. Follow the instructions to the dot and you should have a fully functional log splitter in no time. Excellent use of materials. Very well made. There is just one pertinent downside to this device. The Sun Joe LJ10M does not split small logs. This short coming can be attributed to the length of the ram that is used. So if you are planning on buying this to split logs that have a shorter length, I would urge you to reconsider. Very well built. Can be used indoors. Quiet, convenient & no fumes. One of the prime examples of the electric log splitters is the WEN 56206 6 Ton Electric Log splitter. The design of this log splitter is similar to that of the Sun Joe LJ10M Logger Joe but it has one big difference; it uses electricity. The WEN 56206 can be used to split logs that measure up to 20.5 inches in length and 10 inches in diameter. It does this with the help of the 12,000 pounds of force that it can generate. How does the WEN 56206 work? The WEN 56206 functions by using a 2 HP copper wound motor. This motor requires the use of household current and has no problem starting up. Unlike the gas dependent models, the WEN 56206 does not suffer from cold starts. The 15 amp motor can produce up to 12000 pounds (6 tons) of force. This force is then transferred to 15- ½ inch ram. The ram is then used to drive the log into a sharp wedge which is 4.5 inches in length. The log splits into two pieces with relative ease. How does WEN 56206 rank as far as safety is concerned? The 12,000 pounds of force that the WEN 56206 produces can cause a significant amount of harm to the human body. That’s why its safety ranking is a huge concern. In our opinion, the WEN 56206 has a good safety record because of a unique feature that it has incorporated in its two hand technique. Unlike other models, the ram of the WEN 56206 stops moving and returns to its original position if any one of the two hands leaves their spot on the machine. This reduces the chances of bodily harm significantly. There are a few more important points about the WEN 56206 that beg to be mentioned. They are listed below. Assembly: WEN provides a step by step procedure of how to assemble the product. The instructions are clear and procedure is simple. Electric Instructions: The device is wired for a 120V operation. Ensure that it is connected to 120V, 15-A circuit. Use a 15-A circuit breaker or delay fuse too. This helps to avoid electrical hazards. Importance of Grounding: Electricity always chooses the path of least resistance. This is provided by the electrical grounding. The WEN 56206 is equipped with a grounding plug and a grounding conductor. It will however work only if it is connected to a matching outlet. So ensure that you check the outlet before you plug it in! Motor: The WEN 56206 uses a 2 HP copper wound motor to produce a force of up to 6 ton. The 6 inch tires: The WEN 56206 isn’t very light. To improve its portability, it has been incorporated with large 6 inch tires. These tires help you move it through almost any terrain. Environment friendly: Since the machine uses electricity, it does not provide any fumes. This makes it environment friendly. The downside of the WEN 56206 is related to its power source. Since the device uses electricity, it is important to have a power outlet nearby. This places a limitation on the places in which you can use it in. The WEN 56206 is designed to be used in a shed or a garage. A good outdoor extension cord may help you solve this issue. If you plan on buying this mean machine, check your power outlets and see if it is feasible in your setup. The Powerhouse XM-380 is a device capable of producing a pressure of up to 7 ton. Like the WEN 56206, this device functions on electricity. The Powerhouse XM-380 is designed to be rugged. This device is equipped with a 3.5 HP motor (Which is more than the WEN 56206 has to offer!) and it can produce an extra ton of energy when compared to its WEN counterpart. 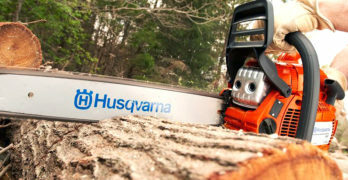 This means that the Powerhouse XM-380 can cut logs which are 24.7 inches in length and 11.81 inches in diameter. How does the Powerhouse XM-380 work? The functioning of the Powerhouse XM-380 is very similar to the WEN 56206. The differences however lie in the dimensions of the ram and the power that the device can produce. The Powerhouse XM- 380 has a ram which is 15.75 inches in length (The ram in WEN 56206 is 15 inches long) and has a diameter of 1.18 inch (the diameter in the WEN 56206 is 0.5 inches). This means that while the ram is just slightly longer, its thickened diameter makes it more studier when compared to the WEN model. The difference in power is 1 ton and is largely attributed to the 3.5 HP motor that has been incorporated in the machine. How safe is the Powerhouse XM-380? Powerhouse has placed two safety features into this model. The first one is the requisite two hand functioning technique which keeps the users limbs out of harm’s way. The second safety feature is the automatic stop function. The machine stops trying to split the log if it cannot do it. There have however been a few complains about the cord of this device. In case you own or are looking forward to owning this device, ensure that you check the cord well before use. Get the cord replaced by the company if you face any issue and do not try to replace it with any other alternative cords. In my experience, changing the cord on your own (so you can save a little cash) is a recipe for disaster! Portability: The Powerhouse XM-380 weighs around 47-50 kgs. This makes it extremely heavy to lift and carry. To solve this problem the machine has been fitted with built in wheels. This has increased the portability of the device. No Pollution: The Powerhouse XM-380 functions very quietly and produces no fumes. This means that it doesn’t contribute to both air and noise pollution. Efficiency: The machine is powerful and it is efficient. Powerhouse claims that the XM-380 can split as many as 100 logs in under an hour. This makes the machine pretty impressive. So far most of the reviews attest to the efficiency of the device. View or download the MANUAL for the Powerhouse XM-380. Automatic ram return. Professional-grade hydraulic system. Splits wood : 20.5″ in length and 12″ in diameter. 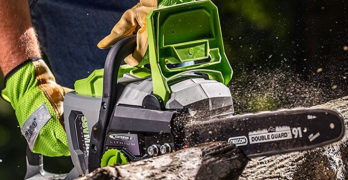 The Boss Industrial ES7T20 tag line advertises that this device can get your wood splitting chore done in half the time that it would take you to do it manually. That doesn’t come as a surprise as the Boss Industrial ES7T20 uses electricity to produce 7 tons of splitting force. How does the Boss Industrial ES7T20 work? The working of the Boss Industrial ES7T20 is very similar to that of the previous electric wood splitter models. It uses a 2 HP motor to produce 7 tons of splitting force. This force is then used to split logs that are up to 20.5 inches in length and 10 inches in diameter. For safety reasons, users are advised not to split logs that are larger than the given specifications. In my opinion the Boss Industrial ES7T20 isn’t exactly the safest device in the market. I say this because it has a one hand operating technique as compared to the preferred two hand operating technique. This means that the user is exposed to considerable safety risks. It isn’t meant for people who are not confident in handling such heavy machinery. Another thing to consider is the fact that even the experts can make mistakes. There are some other points that one must consider if you are interested in buying the Boss Industrial ES7T20 stand out are listed below. Automatic returning ram: This reduces the amount of energy and time required to reset the device so that the next log can be split. Electric connections: The Boss Industrial ES7T20 is fitted with a precision built electric motor that can deliver 7 tons of splitting force. It requires a power supply of 115 V, 60 Hz AC. Remember that this tool is not meant to be operated in DC current. Grounding: The electric cord is equipped with a grounding conductor and a grounding plug. Ensure that you plug it into a socket that is compatible with its requirements. Portability: Though the machine is relatively light (123 pounds), its portability has been further improved by incorporating wheels in its design. A worthwhile upgrade. Split 4-say instead of 2. Make it ergonomic by purchasing the stand. You won’t regret this purchase. Or, you can buy the 10-ton model (ED10T20) that includes the stand — Boss Industrial FT5 Log Splitter Stand. 4-Way Cross Wedge. Split the wood 4-ways rather than two. A practical upgrade. I wish they just included this with product. Boss Industrial CW-S Log Splitter. View or download the MANUAL for the ES7T20. Includes a stand which makes it far more comfortable to work for long hours. View or download the MANUAL for the Boss Industrial ED10T20 wood splitter. Extra extra wide tube log trays. Built in collapsible stand makes it comfortable to use. No more hunching over. One-handed operation. 3 position control system. Splits wood : 20.5″ in length and 10.5″ in diameter. Because it’s electric you can use inside a garage or barn where it’s comfortable. 2-Way Splitting Action. Equipped with two 5″ wedges. View or download the MANUAL for the Boss Industrial ED8T20. View the comparison chart between all of the electric Boss wood splitter models to help you decide which model has the features you need. Horizontal and vertical splitting — 10.9 second cycle time down and back. The name of this wood splitter is bound to catch anyone’s attention but I can assure you that the name isn’t the only thing that makes this product stand out! The Dirty Hand Tools 100171 is a wood splitter that is designed to produce around 22 tons of splitting force. How does the Dirty Hand Tools 100171 work? What makes the Dirty Hand Tools 100171 different from all the other models that we have looked at is the fact that it functions by using gasoline. The 196 cc Kohler engine that is fitted within the machine delivers 6.5 HP. Translated into splitting force, this means that the machine can split wood with a force of 22 ton. While the design may look similar to many of the other wood splitters we have looked at, its efficiency surpasses them all. The Dirty Hand Tools 100171 requires only 10.9 seconds to cycle down and back. This means that one log (which can be up to 25 inches in length) is split every 10.9 seconds! Versatile professional quality log splitter. Can also be towed. How safe is the Dirty Hand Tools 100171? Unlike the previous devices, this machine uses an operator zone to keep the user safe. It is also important to realize that gas powered wood splitters have additional safety hazards when compared to manual and electrical wood splitters. Fires: Sparks from the inside of the engine (it functions on internal combustion) can cause fires. This is especially true if you use the device in areas where there is a lot of dry grass. The problem can be tackled quite easily. All that you have to do is install a spark arrestor. This is fitted on the exhaust of the device. It reduces the chance of a fire considerably. Carbon monoxide poisoning: This device should always be operated in a well ventilated area because it functions by using gasoline. The fumes which arise due to the combustion of gasoline contain high amounts of Carbon monoxide which can be detrimental to health and even lethal. Assembly: The assembly of the device is easy but not fast. It takes two people around 45 minutes to set up the whole machine. Vertical and horizontal splitting: The Dirty Hand Tools 100171 can use its 22 ton of splitting force to split a log both horizontally and vertically. This is what sets it aside from other machines. Trailer friendly: As can be imagined this machine is heavy and weighs around 580 pounds. That is the weight of the machine without any fluids in it. If the fluids have been filled into the machine, the weight can increase up to 621 pounds. That’s why the machine has been fitted with sturdy 16 inch tires and can be towed by using a trailer or tractor. Fantastic built-in stand makes this an excellent value for homeowners. Work at standing height with built-in stand. Splits logs up to : 20.5″ (Length) by 12″ (Diameter). Includes handle and wheels for fast and easy transportation. CSA approved; cable is double-insulated. An inexpensive way to split wood. Still requires manual labor. The simplicity of the Anaconda 878 Slide Hammer Manual Splitter puts it at the top of our list and makes it the ideal Wood Splitter to start with. Let’s take a look at how it works. The Anaconda 878 Slide Hammer Manual Splitter is made up of three main parts: The handle, the wedge and the slide hammer. The handle is made up of a rubberized grip. This helps ensure that you have a firm hold on the device. Grip isn’t the only advantage that this handle has to offer. It offers comfort and also helps in absorbing the vibrations that you would usually feel in other wood splitters. This helps reduce the strain on your hands and wrists. In my opinion, the handle should always play a very important role in choosing your machine. Continuous vibrations and strain can lead to wrist pain and wrist disorders when the device is used for extended periods of time. The sledge hammer is what causes the pounding motion of the device. It works together with the sharp edge of the wedge to give you the desired results. The Anaconda 878 Slide Hammer Manual Splitter has a lot going for itself. It is easy to use, cheap and relatively safe. Unlike many other devices, this wood splitter does not require overhead swinging. So it helps reduce the danger that this device can pose. Automated Wood Splitters may throw wood pieces in the air and this can cause injuries. Since the Anaconda 878 Slide Hammer is manually operated, you will not encounter this problem. The Anaconda 878 Slide Hammer can be used on all kinds of wood pieces and in any environment. Its weight also makes it extremely portable. While some claim that this device can be used by children, it isn’t something that we would advise. Accidents happen and with children the potential of accidents happening just multiplies. Memory foam palm padding reduces stressful vibrations. Most reviews state that there is however one common downside to this device. That is its durability. Some people have complained that the handle isn’t as sturdy as Anaconda claims it is. This means that you may have to repair or replace the handle after a prolonged use. Other than that it is a great piece of equipment! Bear in mind that the Anaconda 878 Slide Hammer may take multiple strikes before it can split a log. It is more time consuming than the mechanical wood splitters but it is definitely much better than using an axe. It’s designed with the body ergonomics in mind and helps reduce the strain on the person’s body. 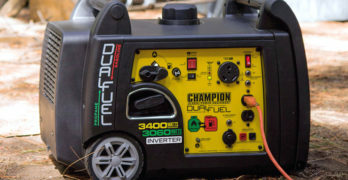 This makes it an excellent choice if you don’t want to use an electrical of fuel operated wood splitter. All good devices emphasize on safety and rightly so. Choosing a power tool requires a lot of thought. These tools can be dangerous even in the best of hands. A tool which has a number of safety checks in place should always rank higher than others. Efficiency should be the second thing that you look at. This will tell you if the wood splitter that you are buying is meant for you or not! NEVER operate the log splitter on slippery, wet, muddy or icy surface. ONLY operate your log splitter on flat even ground. Operating on a slope makes the wood splitter unstable and it could roll over or logs could fall off. DO NOT attempt to move your log splitter over hilly or uneven terrain. BLOCK the wheels to prevent movement of the log splitter while in operation. DO NOT leave tools or wood on the tool while it is being used. ONLY operate your log splitter in daylight or under good artificial light. Don’t operate at night. KEEP your work space clean. Remove split wood immediately so that you don’t accidentally trip over it.